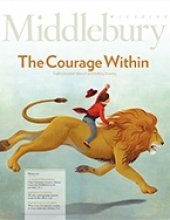 Middlebury Magazine is a periodical dedicated to communicating the high level of academic and cultural achievement at Middlebury College; the accomplishments of its outstanding alumni; and the intellectual, cultural, and social life on campus. The magazine highlights faculty scholarship and teaching; reports on student academic, artistic, and athletic accomplishment; and illuminates the professional and personal lives of Middlebury alumni. Through visuals and prose, the magazine communicates the natural beauty of the College and Vermont. We like stories that have central characters and that tell us something we don’t know. Substance is good; so are stories that make us care about the subject matter. Controversy and humor have their place in this magazine, as well, and there needs to be a Middlebury hook. Middlebury Magazine buys first serial and electronic rights. When pitching feature or department stories, Middlebury Magazine prefers that you submit a detailed query letter along with published clips to midmag@middlebury.edu. For the back page essay, it’s appropriate to submit a completed manuscript in Word or RTF format.